In London’s Tate Modern right now, in the midst of the brilliant Conflict Time Photography exhibit on the 3rd floor, is a curious set of rooms called A Guide for the Protection of the Public In Peace Time. It’s a strange space curated by a group called the Archive of Modern Conflict; apparently a publishing house concerned with artefacts of the past; forming them together in new and unusual ways. And in this room of propaganda and subversion, I see this image on the wall. I was, its fair to say, pretty stunned. You see, I’d seen this image before. It is the cover image for a comic picture book called Album De La Revolucion Cubana, which I found on a market stall in Plaza des Armes in old Havana back in May this year. It’s now perched on my Hackney living room bookshelf. A bit of a surprise, I can tell you, to see something you picked up at a market for a tenner displayed on the wall of one of the world’s greatest contemporary art galleries. And seeing it displayed in this way lead me to want to find out more about it. The book itself is fascinating. 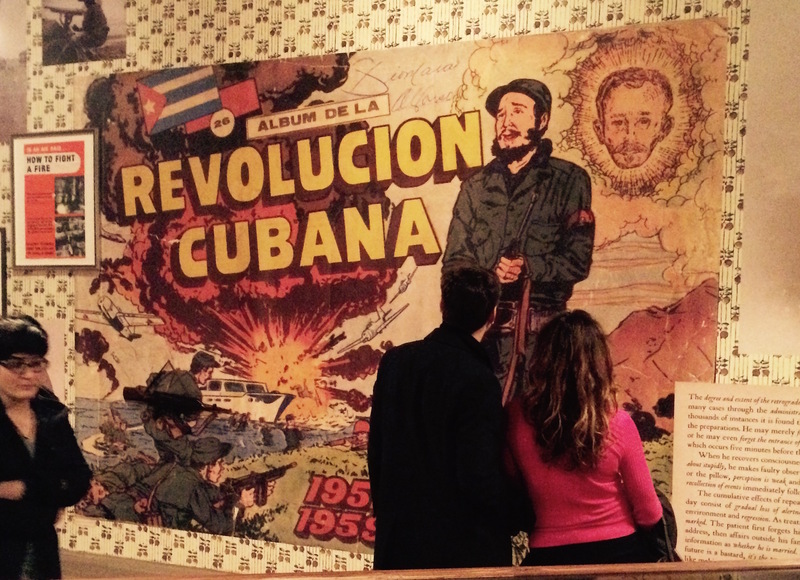 Designed for children, it is a blow by blow retelling of Castro’s guerilla war with Batista’s government from 1952 to 1959. 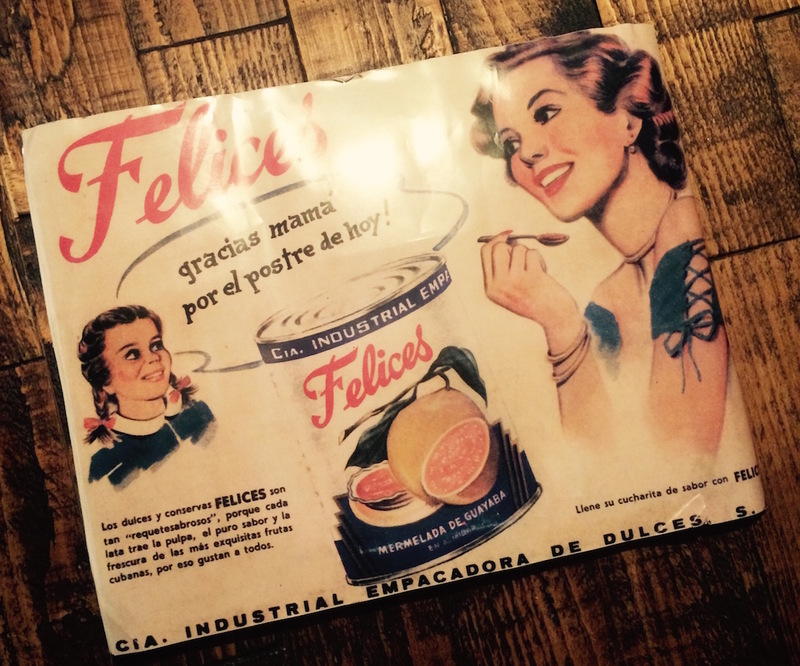 What makes it particularly special though is that each scene in the revolution is told by an individual picture card, which it seems were given away with cans of Felices canned fruit, collected and stuck into the book by kids. I remember when I got it how struck I was by the design and approach – it seemed to me to be a particularly overt piece of marketing designed to sell the story of the revolution, which is kind of ironic given this is a country that deliberately closed itself off to the usual blends of brand capitalism. Castro, of course, is presented as the hero, inspired by Jose Marti’s Cuban independence movement in the 1800s (that’s his face hovering in the sky behind Fidel on the book’s cover), and flanked by his brother Raul and of course the beautiful Che. 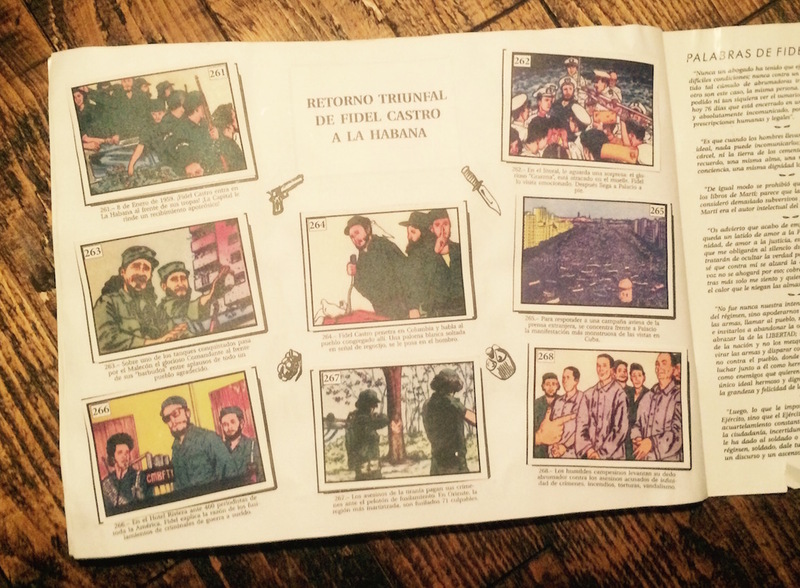 Each page comes with illustrations of guns and grenades, Cuban flags and army tanks, and even though the commentary is in Spanish, the drama jumps out of the illustrations – underhand backroom dealings by Batista, the suffering and sacrifice of the Cuban people, the bravery of the guerillas, fighting for the future of their country. There’s a fair bit of chatter about the book online. Over on dropby, one Cuban man describes it as “a plaything from my childhood” which he since found in a restaurant in California – owned by a man who also found the book in Havana’s Plaza des Armes. Then on the Libriquarian site for ‘the sale of fine books’, the curators are displaying the Album with a $2000 price tag. For a moment I’m pretty excited. Not that I’d sell my copy of course. But to see that others have found it too and recognise it as a special piece of history reminds me of my own wide-eyed excitement when I flicked through its pages back in the hot Havana sun. On closer inspection however, it’s very clear that mine is a copy, rather than an original. The pages are too white; the picture cards are tinted in a distinctly photocopied way. Nevermind. It’s the symbolism of it I like – somehow enhanced by the fact that some enterprising market stall owner has decided to occasionally recreate the full thing now, in 2014, sticking in each of the 271 pictures by hand in the hope of selling it at a profit to a tourist like me.